I have previously discussed at some length the proliferation of elaborate womanless beauty pageants in the Deep South of the U.S. We’ve noted the irony of parents dressing their sons like beauty queens while openly condemning trans people. In a different culture halfway around the world, a similarly befuddling phenomenon exists in the form of “Little Miss Gay” pageants in the Philippines. Despite living in a society dominated religiously by Catholicism and facing widepread opposition, the LGBT community in the Phillippines is quite active. As in the U.S., there are circuits of “Miss Gay” pageants in which femulating men compete. 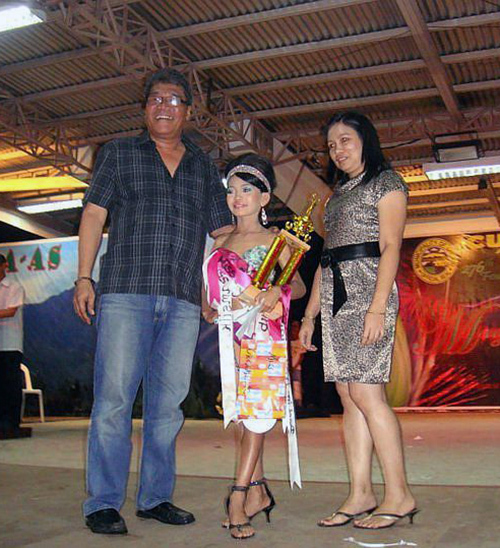 But where the similarity ends is that while such pageants in America are strictly adult events, in the Phillippines they reach far down in age to include young boys competing for the title of “Little Miss Gay.” Such events are sometimes staged in conjunction with adult pageants, while other are unaffiliated affairs sometimes sponsored by schools or churches. As in the U.S. womanless pageants, the “Little Miss Gay” events can often be very elaborately staged affairs, even in impoverished communities. And the attention given to the femulations is even more intense and detailed. While U.S. schoolboys in womanless pageants are mostly doing it as a one-time lark, some of the Filipino boys regularly compete in pageants. Many of them adopt female names and personas and some even grow their own hair out to feminine lengths and have it cut, styled and colored like a girl. And the parents – the power behind the crown as in U.S. female child beauty pageants – will spend prolifically on their son’s pageant wardrobe. Another difference from American womanless pageants is that while the U.S. affairs are strictly PG-rated, the Little Miss Gay events sometimes find children dressing, dancing, singing or acting in what we would consider a very inappropriate sexually provocative manner. It is very off-putting and creepy to Westerners (like me) to learn about this phenomenon. Who are these boys? Are they gay and/or trans and embracing it at an early age? Are they being exploited by their parents or worse, is there some degree of coercion or abuse behind it all? As I said, I’m not academically equipped to find answers and only suggest that the phenomenon is one that merits further study and investigation by more qualified people. Why is that person in the purple dress slouching so? I'm certainly not an anthropologist, but I do speak Tagalog and lived in the Philippines for a couple years so perhaps I'll chime in. Yes, it is a rich and complex culture rooted in Catholicism but with myriad influences from all over Southeast Asia. The Tagalog word "Baklat" is used to describe both gay and transgender individuals, however it's predominantly the latter. Despite being a Christian nation (at least in the Northern Islands) transgender people seem to be widely accepted. Most that I encountered worked at beauty salons and often lived together as roommates, as it's common for people to live and work at the same place. I never encountered a "Little Miss Gay Pageant" but given the open-minded culture, I'm not at all surprised. Crossdressing is not really frowned upon. In fact it's not unusual for young men to wear skirts for a period of time after circumcision, typically in their pre-teen years and outdoor sponge baths are made a little more modest by covering up with an elastic waist skirt. Of course it doesn't help that Asians men are beautiful to begin with and can generally pull off a very convincing transition. Also clothes are really inexpensive despite it being a relatively poor country. To be honest, I have considered returning to spend my retirement years as a baklat. Acceptance is not 100% but it's one of the few things they do better than Americans. The 'Little Miss Gay' pageants give NEW MEANING to Janice Ians' LYRICS "I Learned The Truth AT Seventeen".